An hourlong Christmas episode lets this anime futuristic satire embrace its weirdest and most wonderful sides. “Neo Yokio” is a show wholly committed to its aesthetic, and the Netflix series’ holiday special “Neo Yokio: Pink Christmas” contains the same idiosyncratic charm that made its first season a singular delight. It opens with a wintery remix of its iconography, complete with a scoreboard ranking the fictional city’s eligible bachelors and a snowy overview of its fantasy version of New York (centuries after the end of a demon war that left parts of the city underwater). Even as the special references its anime ancestors, “Pink Christmas” also revels in its own bizarre framework. Arrangements of “O Tannenbaum” and “Greensleeves” slide right alongside the show’s usual Baroque-heavy background music. The Homer-sampling narration sets up a world where people have casual chats about the potential presence of evil, shapeless forces the same way they talk about hosting podcasts and using social clout. “Pink Christmas” is more than a continuation of the exploits of young socialite Kaz Kaan (Jaden Smith). It’s an overview of the characters that inhabit this futuristic world where interdimensional beasts lurk in the shadows and table manners can become grounds for a telekinetic brawl. Seesawing between the anxieties of being single and under a microscope in a big city and battling for the fate of humanity makes for a kind of whiplash, and it might take adjustment for first-time audiences. Still, the show’s appeal doesn’t come from parsing the weird “Neo Yokio” internal logic; it comes from the passion-project feeling that everyone involved seems to be delighted they’re pulling this off at all. As in the main show, the voice performances are a little scattered; even so, each performer is so committed to each particular character choices that it’s hard not to enjoy. Jude Law is still an unparalleled pleasure as Charles the mech butler, this time used sparingly to narrate the proceedings in the style of the “Princess Bride” Grandpa. Desus and Mero are always welcome additions, this time returning as Kaz’s friends (and doomed entrepreneurs) Lexy and Gottlieb. Jason Schwartzman remains one of our finest on-screen jerks, here voicing Kaz’s preening nemesis Arcangelo Corelli. The increased presence of Richard Ayoade, voicing an overeager Bergdorf Goodman sales clerk, adds a nice twist. Beyond the genre trappings and layers of artisanal details that encase the show in its own protective layer, “Neo Yokio” knows how to position itself in a TV world dominated by loud, busy pleas for audience attention. The stream of winks and nods to animated classics continues, including one to “A Charlie Brown Christmas” done with exquisite abandon. There are plenty of moments ripe to exist in meme form, and there’s some extra participation from series creator and Vampire Weekend frontman Ezra Koenig that might give non-genre fans reason to tune in. “Pink Christmas” leaves very few seasonal conventions untouched. In finding the true reasons for the season, “Neo Yokio: Pink Christmas” weaves through and upends them all. Secret Santa tropes, holiday spectaculars, and even traditional dinners each are subverted in turn. In the world of “Neo Yokio,” Christmas is everything and nothing all at once. This free-for-all generates the freedom to play with anthropomorphized Christmas trees and elaborate gift-giving in the same spirit that Season 1 relished its convoluted fashion rules and cross-city car races. “Pink Christmas” also gives the show’s team of animators a little license to experiment with the show’s visual stylings. The more the special’s title works into the proceedings, the more it feels like its own creation. Rather than being used to set up any future storylines or tease fans with the promise of more, “Neo Yokio: Pink Christmas” uses its final showdown as a chance to acknowledge that it might be more self-aware than it ever let on before. 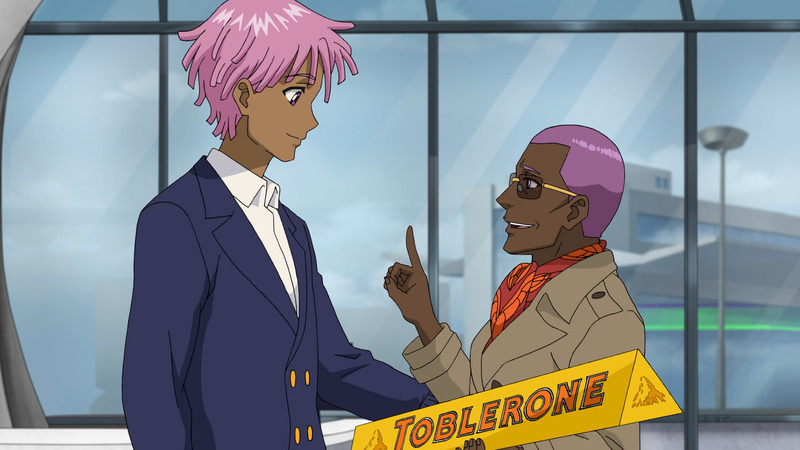 “Neo Yokio” might be made for specific tastes, but it’s far from impenetrable. If the holiday spirit is really about unity and finding common ground, “Pink Christmas” offers up something unapologetically wild. For everyone, it’s a blast. “Neo Yokio: Pink Christmas” is now available to stream on Netflix.